To recognise the main institutions of the EU, their locations and functions. To understand the roles of the European Commission, the European Parliament and the EU Council in the decision-making process. To understand how European states and citizens are represented in the different institutions. To know the extent and level of decentralisation of the European administration. To know the sectors of activity of the different European agencies. The European Council establishes the overall direction of EU policy, but it does not have the power to pass laws. 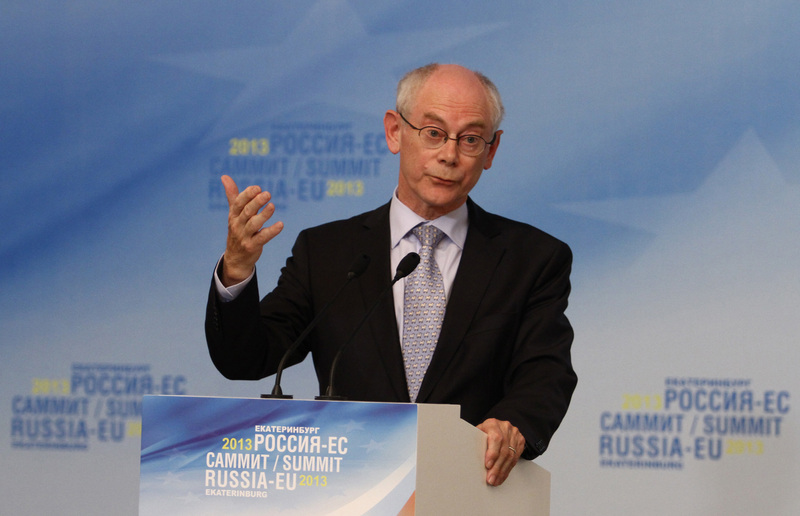 It meets for two or three days at least once every six months under the leadership of its President, who is currently Herman Van Rompuy. It is composed of the Heads of State, or of Government, of each member state and also the President of the EU Commission. The Council of the European Union is also known as the Council of Ministers and represents the governments of the member states and forms part of the legislative power. The formations of the Council of the EU vary according to the subject to be treated (natural environment, economy, employment, etc.). It has a rotating presidency, with a duration of six months, which is held – following a previously established calendar - by the corresponding minister from the member state currently charged with this duty. The European Commission is the body that exercises executive power; its members are chosen every five years by the European Parliament. It also has the capacity to sanction any member states that fail to comply with community law. 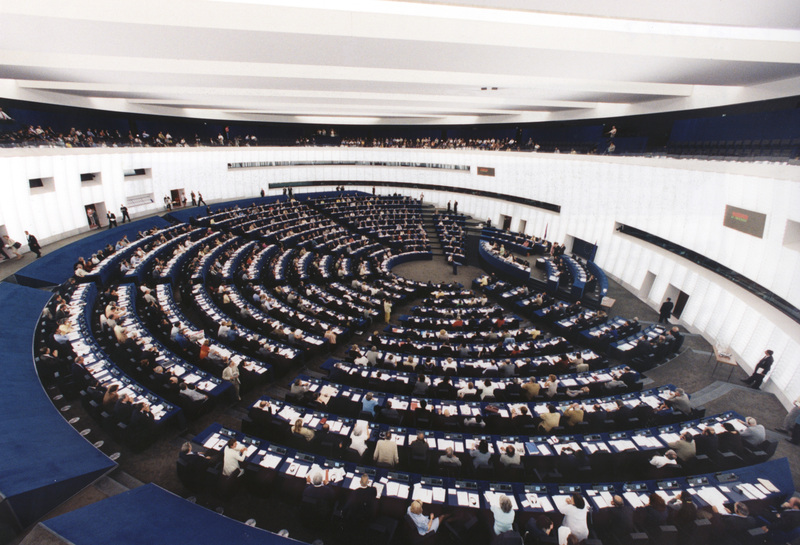 The European Parliament represents the citizens of the EU and is chosen by them every 5 years. It also shares the legislative power with the Council of the EU. The Court of Justice of the European Union controls the application and correct interpretation of community law. 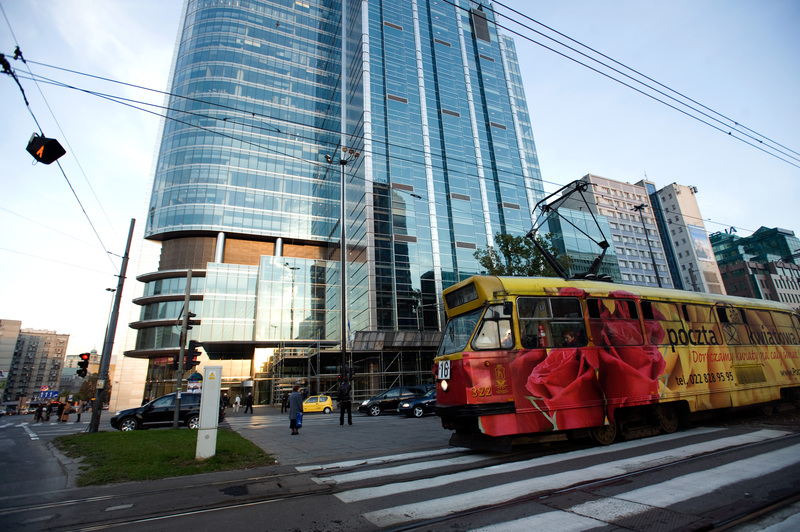 The European Central Bank was established in 1998 in order to govern monetary policy within the Eurozone. Its main function is to maintain the acquisitive power of the Euro and, by doing this, the stability of the processes within the Euro zone. The European Court of Auditors has the role of improving the financial management of the EU and informing on the use given to its public funds. The European Economic and Social Commission. The Committee of the Regions. Participation in European elections has fallen by 19% since the first elections to the European Parliament in 1979. In 2009, only eight countries had electoral turnouts of more than 50%. Do you think that there is a relationship between participation in the European elections and the confidence of citizens in the EU? Do you think that the way that the EU works is too complicated to be understood by the majority of its citizens? 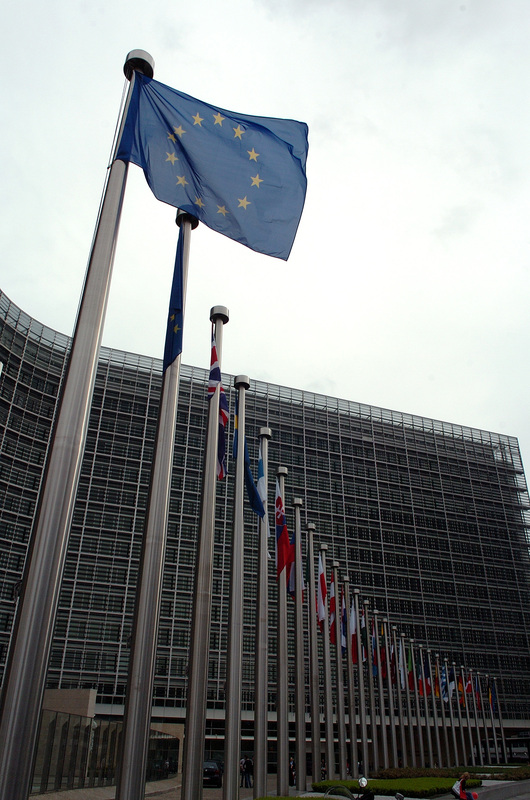 >15 The Headquarters of the main institutions of the EU. 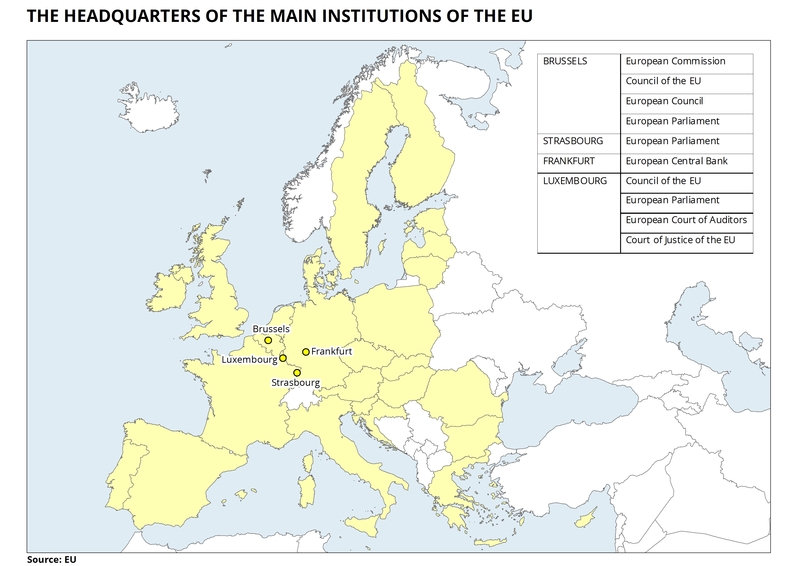 Map of the main European institutions. Some institutions have several seats. 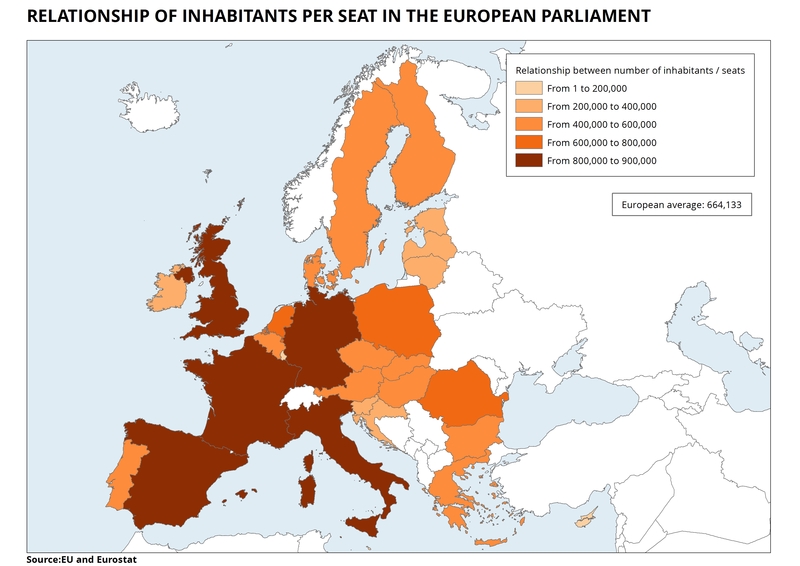 >15 Relationship of inhabitants per seat in the European Parliament. 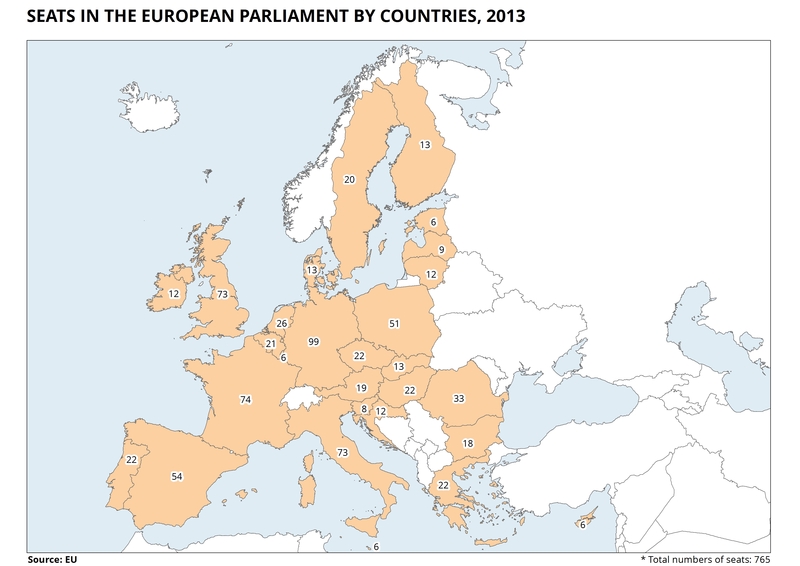 This map shows the difference in representation of the citizens of the member states of the European Parliament. 12-15 The Institutional Triangle (fr with subtitles in bg, da, et, cs, de, el, es, en, fr, it, lv, lt, hu, mt, nl, pl, pt, ro, sl, sk, fi, sv, 3'02''). Explanation of the decision-making process based on dialogue between the European Commission, the EU Council and the European Parliament.